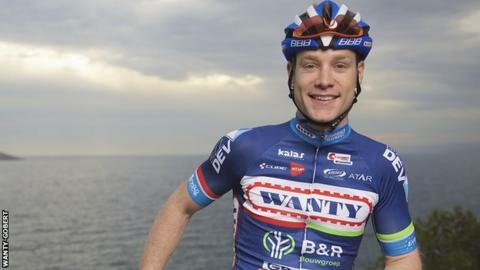 A crash with a motorbike which killed Belgian cyclist Antoine Demoitie was an "unfortunate accident", says his team. The 25-year-old was hit by the motorbike after several riders came down in a crash as the Gent-Wevelgem race passed through northern France. Jose Been, spokeswoman for the Wanty-Gobert team, told BBC Sport it was "not a case of the motorcyclist going too fast and causing the crash". Demoitie was taken to hospital in Lille but died some time later. A French police inquiry is under way and the sport's governing body, the UCI, is co-operating with the investigation. Demoitie was among several competitors involved in a fall in the one-day race, which was won by world champion Peter Sagan. "The cyclists fell right in front of the motorcyclist who had no time to react and just hit them," Beem said. "The motorcyclist is very experienced and has been in the races a long time. He is as grief-stricken as we are. "It was a very unfortunate, horrible accident for both sides." At a news conference on Monday, tearful team manager Jean-Francois Bourlart said Demoitie had ridden his first WorldTour race - the E3 Harelbeke in Belgium - only last week. "He was very proud of himself and we couldn't have been more proud of him," he said. "On Sunday, the incredible happened, the inconceivable. We can't believe it. We are angry. We cry and we think of his wife Astrid and his family." Earlier on Monday, Professional Cyclists' Association president Gianni Bugno, a former rider, said: "I do not want to accuse anyone, but make everyone reflect on the responsibility we have to ensure... a very high level of attention, awareness, and control over safety standards during each race." Several high-profile professional cyclists have paid tribute to Demoitie, while others have questioned whether there needs to be rule changes around motorbikes, which are used mainly for security and media. In a Facebook post, German sprinter Marcel Kittel said the sport had reached a "new and very sad low point in the history of cycling and safety".